Michigan photo booths provide a FUN way to help you strike a pose and capture the memories. Trust us, your family and friends will be dragging you in the booth to take photos the entire night. When you bundle the photo booth with your entertainment package you get HUGE discounts that are included with great options. • Design Your Own Footer! You also get double prints and there is no limit on the photos (color or black and white). You get double prints so one half goes to your guest as a keepsake, while the other photo strip can be put into your scrapbook. If you would like us to help you create a scrapbook, all you have to do is bring the book + supplies. This usually costs $10 in supplies. Our main goal is to save you both time and money. Another reason we encourage our clients bring the supplies, is so that your scrapbook uniquely resembles YOUR style. Most companies will give you a memory CD at the end of your night with all your photos, but we all know that disc ends up getting scratched. 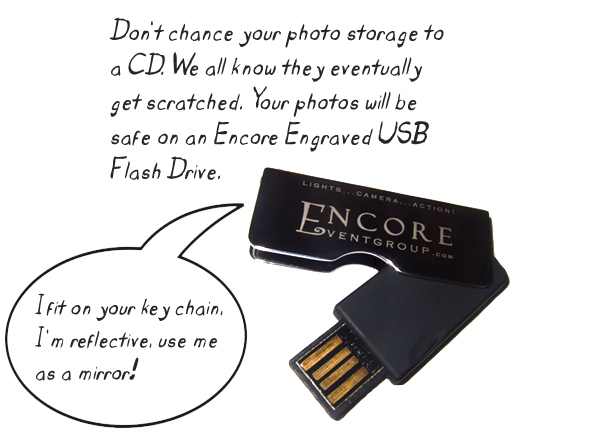 Your photos will be safe on the USB stick we give you. Photos can easily be shared with family and friends once your reception is over. Do you want to make your photo booth experience stand out? Our team will create a special design for your wedding reception. Family and friends will be amazed at how detailed your images turn out. Best of all, we can incorporate patterns that complement the theme of your big day. The end result gives depth to the look and feel of your pictures. Check out the thumbnails below get a sample of custom layouts, and remember to ask about them when you contact us! IMPORTANT: Encore only uses high quality dye sublimation printers for our photo booths. This means your photos are waterproof and will last for dozens of years. Any photo booth vendor you consider should use a dye sublimation printer!